Nanwalek, formerly known as English Bay, is located at the southwest corner of Alaska’s Kenai Peninsula. The name of the village means “place by the lagoon” as it is located by a lagoon that is connected to an extensive lake system. Between the lagoon and the beach, a narrow landing strip serves the community as runway for small aircraft. Since the village is situated in a potential tsunami zone, most of the houses are built on higher ground between the ocean and the surrounding mountains. In the old days, most houses stood directly on the shore. Back then, the area now occupied by the airport was much higher, and it gradually sunk partly due to the 1964 earthquake and tsunami, and partly as a result of the landscape work that was needed in order to place the airstrip. Currently, there are about 50 houses and community buildings in the village, including the Sts. 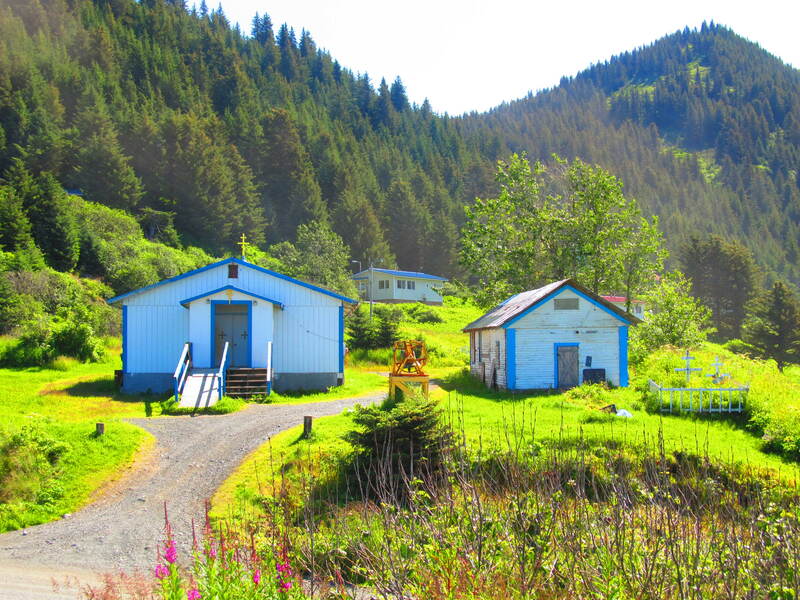 Sergius and Herman of Valaam Russian Orthodox Church, the Nanwalek Elementary and High School, an ANICA store, post office, the Robert Kvasnikoff Community Hall, the Nanwalek IRA Council buildings, a clinic, a teen center with a library, and offices for the North Pacific Rim Housing. Nanwalek is only accessible by boat or by air. There are two airplane companies that fly their small aircrafts on a regular schedule to the village, providing not only travel, but also postal service and freight delivery. Anything that cannot fit on airplanes is delivered by a barge or local skiffs, and while several people in the village own boats, there is no regular scheduled marine traffic between Homer and Nanwalek. Also, the water traffic is only a viable option for a few months out of the year, due to the treacherous marine conditions in the fall, winter, and early spring. The barge is owned by a Homer entrepreneur that comes to the village even during the winter months to deliver large orders, but its arrival is strictly weather dependent and an on-demand basis. Seldovia, a small town of approximately 300 inhabitants, is the third occupied settlement on the Southern side of Kachemak Bay. In the past, Seldovia served as a hub to the region, with a sizable Alaska Native population. Today, however, Homer, with a population of approximately 5300, is considered the regional hub. Homer is on the road system and it provides access to medical, business, and infrastructural opportunities. It is located 35 miles northeast of Nanwalek. The closest settlement to Nanwalek is the village of Port Graham located approximately four miles to the northeast. The two villages share not only family relations but also many customs and traditions. Interestingly, the English names of the two villages were switched by a cartographer in the late 1800s. Thus, English Bay sits out on the tip of the peninsula, while Port Graham is located further in the bay. 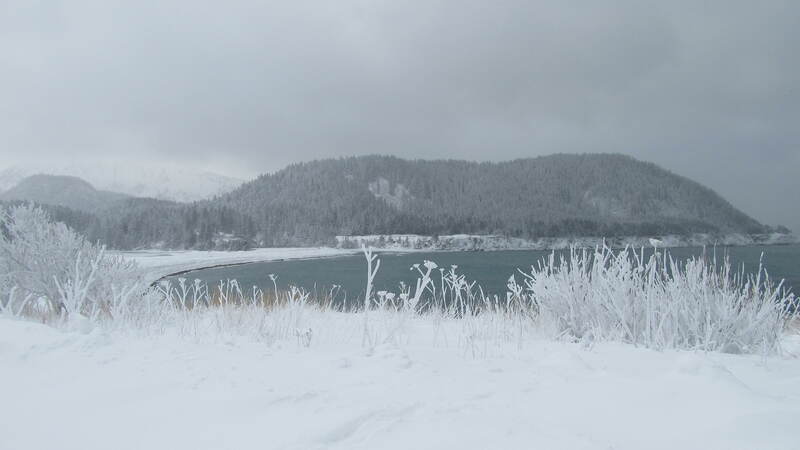 In the surrounding area of the village, especially towards the Outer Coast of the Kenai Peninsula, there are multiple historically and culturally significant sites that Sugpiaq people remember and visit for various reasons from time to time. These sites are not abandoned; rather, they are currently uninhabited. [i] People feel connected to these sites for various reasons: they know their ancestors once lived and died at these locations, they grew up listening to stories that happened at these places, and they know how these places sustain them with subsistence resources and communal memories. You can read more about these Places that Count here. The natural surroundings of Nanwalek are rather stunning. When approaching the village either by air or by boat, one cannot help but to admire the astonishing view of snow covered mountaintops, waterfalls and caves dotting the rugged shoreline, lush vegetation composed of a mixture of inland and coastal plants, and the fantastic vista offered by the ocean. During summer visits, sighting of whales, sea otters, puffins, bears and even mountain goats are quite normal, not to mention the view of St. Augustine volcano that is located a mere 35 miles off the coast of the village. 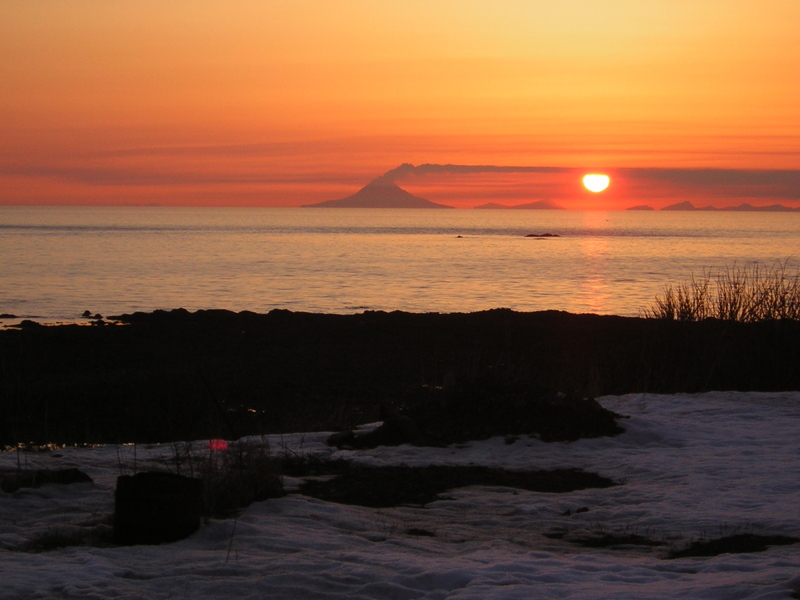 On clear days, it is possible to see the silhouette of the Alaska Peninsula’s coastline. The village itself occupies most of the area around the lagoon and the adjacent small plateau that lies between the sea and the mountains. The community is currently home to over 300 residents and almost all the land that could be built upon, has been. The general transportation within the village is usually by Hondas (all-terrain vehicles), although the number of trucks, cars, and side-by-side vehicles are continuously increasing. There are no paved roads in Nanwalek; dirt roads, gravel roads, and a trail that leads to the series of lakes situated inland from the village are all locally maintained and cleaned. Theoretically, Nanwalek should enjoy a temperate ocean climate year-round, which is characterized by mild winters and cool summers. However, as it is located in an area prone to strong winds, snowstorms, and in general, extreme weather, it finds itself isolated from the outside world frequently. In addition, volcanic eruptions have often complicated the lives of those in this community. 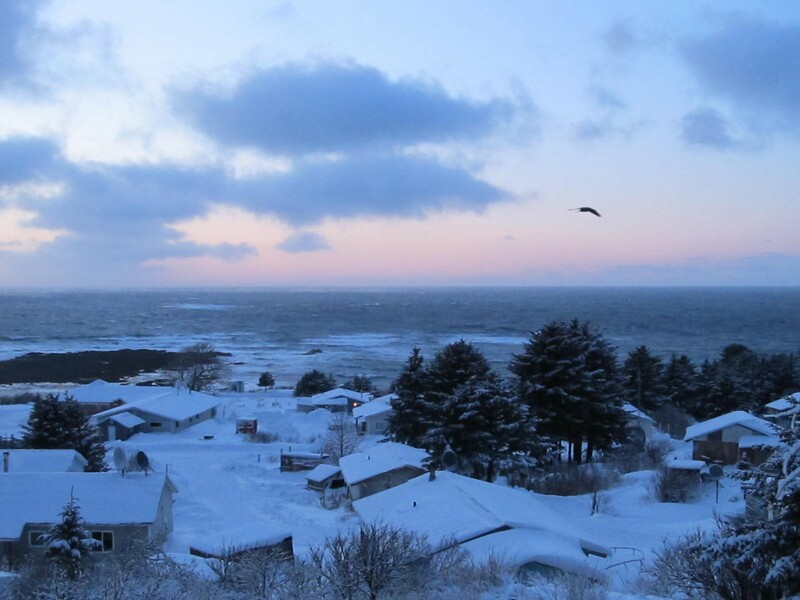 While the village has its warm days during the summer as well as striking sunshine in the winter months, locals know that blizzards and strong storms can be lurking just around the corner. [i] For further information on the difference between the two see Gordon Pullar, 2001, Alutiiq Land, Land Claims, and Identity, in Looking Both Ways, Heritage and Identity of the Alutiiq People, pp 82-88, Fairbanks, University of Alaska Press.